On a cold, dreary, rainy Tuesday this week I burned a Peach Mango Salsa candle & made a beach table runner. I forgot to put "island" music on but that's ok. The tropical mood was there anyway as I tried to decide what fabric to use for my umbrellas. The stripes don't match perfectly but I'm ok with it.I did my best without obsessing over it. 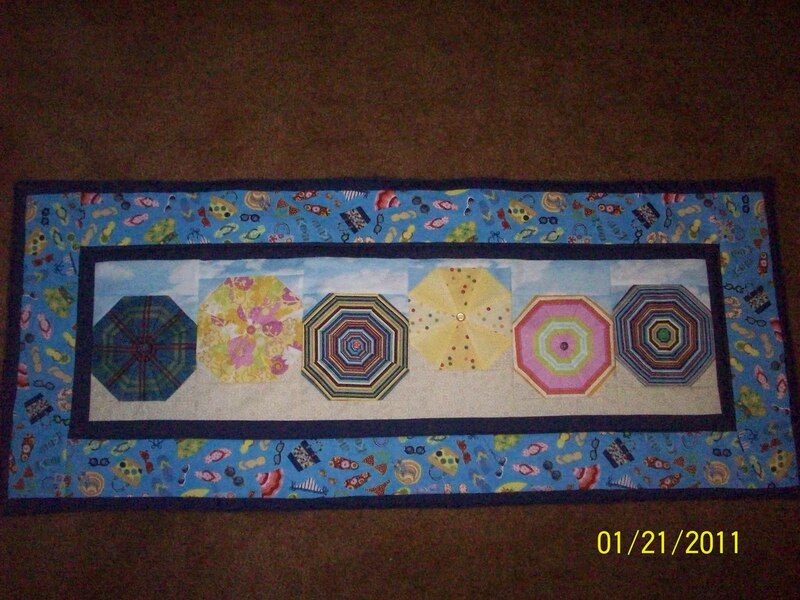 The pattern is "It's a Beach" designed by Karen Montgomery. I'm sending that pattern out to my friend, Beth. She can now make it for her new DIL . The DIL is from Virginia Beach & will now be living in Colorado. No beaches there. So cute! You challenged yourself with the striped umbrellas, but it turned out great! Got it today! You are the BEST! I really like yours!! How adorable is that! So cute. It doesn't matter if your stripes match or not that is so cute! I love it!